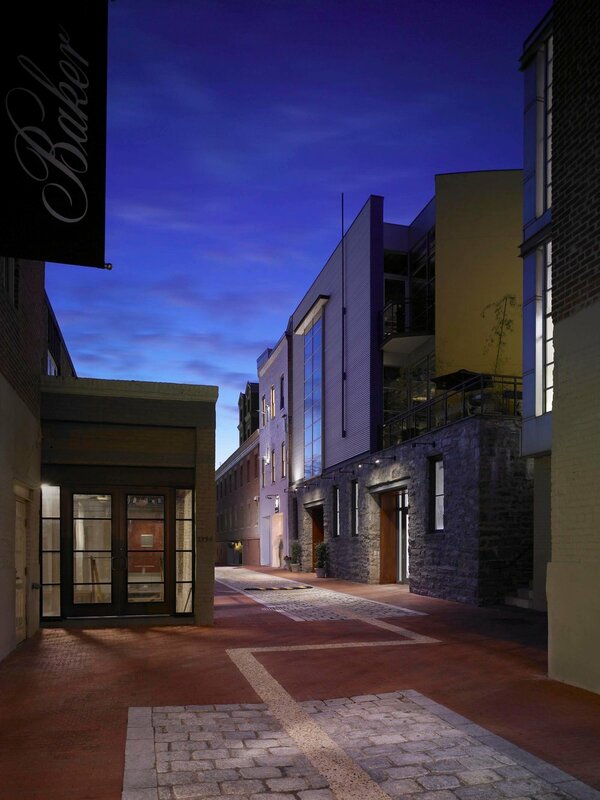 Cady's Alley is a 120,000 square foot retail and residential development located in the historic Georgetown neighborhood of Washington, D.C. The project was undertaken in the early 2000's in order to create a new high-end design-oriented retail district organized around what was at the time a utilitarian service alley. The landscape scope includes the alley itself, a small courtyard with outdoor seating for a nearby cafe, and a pedestrian connection that leads through the block to a nearby retail corridor. The design concept for the project emerged from two key determinations. First, that in order to preserve and enhance the character of the alley it should remain a shared space that provides undifferentiated access for pedestrians, private automobiles, and service vehicles. And second, that the paving design should remain sensitive to the historic character and materials of the space, but also celebrate the way the alley actually functions. Accordingly, the paving pattern (and grading) acknowledges that runoff drains down the center of the alley while also helping to clarify circulation patterns for motorized vehicles and pedestrians. During the development of this project, LAB worked closely with the developer, a total of five architects, the local Advisory Neighborhood Commission, the Commission of Fine Arts, the National Park Service and the District’s Department of Transportation. As the only consultant working on the entire project, the LAB design team worked hard to make sure that the disparate components were coordinated in order to complement the historic character of the alley. Years later, LAB worked again with Eastbanc in order to design and implement additional improvements including new lighting, traffic-calming, and decorative planters.